Looking for a delicious salad dressing to spruce up your greens this summer? Give this Blueberry Vinaigrette a try! Ready in just 5 minutes and with only a handful of ingredients. In a blender, combine blueberries, vinegar, honey, lemon, salt, and pepper. With the blender running, slowly pour in oil, and continuing blending until completely emulsified and creamy, about 30 seconds. 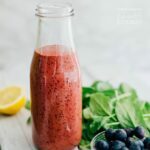 This recipe for Blueberry Vinaigrette Salad Dressing was printed from AmandasCookin.com - https://amandascookin.com/blueberry-vinaigrette-salad-dressing/ and can only be printed for education or personal use.